First off...there is nothing cuter than a fresh bathed baby!! Oh the sweet sweet smell of Baby Magic!! I'll never tire of this smell! Poor Keegen is 5 and I still put the lotion on him after a shower. The other day he said..."MiMi...I really don't need lotion!" I said...as long as I'm giving you a shower we'll use the lotion! :) Too bad he's too big for me to wrap up, hold in my arms, and sing my silly made up burrito song! ps...Preston doesn't think he's too big for lotion yet! Nobody tell him either! "Are you kidding...you want me to smile again?" Sunday was our 17th anniversary! Mike requested Chicken fried steak! AND...you can't serve it without mashed Potatoes & Gravy, Carrots, and homemade rolls! This was a request too...Coconut Cream Pie! Saturday was a day spent at the game with 3 of my favorite boys! Photo's are only of 2...I couldn't get Mike to pose with his Cowboy's "gun"! *Heat oven to 350°F (325°F for dark or nonstick pan). Grease bottom only of 9-inch square pan with shortening or cooking spray. *In small bowl, beat pumpkin filling ingredients with electric mixer on low speed until smooth. Set aside. *Make brownie batter as directed on box. Spread 3/4 of the batter in pan. 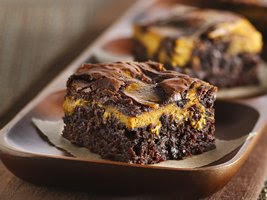 Spoon pumpkin filling by tablespoonfuls evenly over brownie batter. *Spoon remaining brownie batter over filling. Cut through batter several times with knife for marbled design. *Bake 40 to 45 minutes or until toothpick inserted comes out almost clean. Cool completely. Store covered in refrigerator. NOTE: You may want to double this recipe and put it in a 9x13 pan! YUM! !